Pan size and how much it can hold can be very confusing. If you have an unusual shaped dish, and are unsure about the size/capacity of your dish, measure the number of cups of water it will hold, to check the volume of the dish. Here is a very helpful list indicating the volume of most baking pans. One dish I use over and over again in my recipes is a 9x13x2 inch baking dish. This is a standard size dish that is readily available in kitchen shops and even most grocery stores. It will hold 15 cups of ingredients. For my Sausage and Egg Casserole (video) you will need a 9 x13x2 inch pan. The amount of filling in that recipe is adjusted for this size pan. The same is true for making my Lasagna Recipe (video). 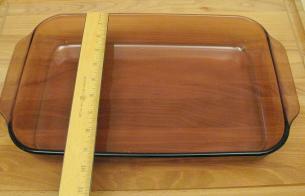 Decorative 9x13x2 inch baking dishes are very useful for both baking and serving. Many of these decorative dishes do not quite measure 9x13x2. In the photo below, I am turning Chicken Cutlets (Video) into Chicken Parmesan. I just needed a dish big enough for the cutlets to fit in a single layer. So it wasn’t essential that the dish be exactly 9x13x2 inches. 7 Layer Dip (Video) was also made in a decorative dish measuring approximately 9x13x2. Two round, 8-inch pie dishes would have worked as well. With my Meatloaf Recipe (Video) (shown below) I made a free-form loaf in a 9x13x2 inch baking dish. A plain Pyrex dish costs less than $10. I think it is definitely worth the investment. Cheers! I’m not sure how anyone could survive without a couple of pans like this in their kitchen. Like you, I use mine for almost everything I cook in the oven. I had to buy a second one because one always seemed to be dirty. Hi, I’ve been looking at http://www.lakeland.co.uk and they have a pan that is 3″ high not 2″… does that matter? Surely I can just fill it to the right height? Hi, I was looking at Lakeland and they have a 9x13x3 inch pan… is it ok for it to be an inch higher? I’m guessing yes as it’s not having enough height that would be the problem, but I thought I’d ask to check. Hi Alex-One inch higher should be just fine! As you can tell, some of mine are an approximation! Kathy, thanks for the quick response. Given the difference in US and UK amounts (I never realised that a US eating table spoon could be different to a US measuring table spoon and that a UK table spoon could be different to both of them and also different to a UK measuring table spoon… how confusing is that??? When I look at onlineconversion.com it seems that there is also a metric table spoon! Your recipes are so well explained, I have finally decided to try and start cooking, but the different measuring units is really starting to confuse me, so I was thinking… do you think it is easiest for me to just get a good pair of scales and some measuring jugs, and keep a unit converter handy alongside your recipes? I figure this way I can pre-measure all the amounts into a suitable container and then just follow your recipes through without stressing about amounts. based cook, I would suggest that you get a decent set of electronic scales and a set of metric measuring spoons. Recipe books and recipes in magazines etc will be published giving metric measures (often with their old imperial equivalents) and you will have a wide choice of food to make if you have these measures. If you are interested, I would suggest that you also get a decent cook book such as Nigel Slater’s Real Food or Real Cooking as good starter books. Alex it is all very confusing measuring by weight vs. measuring my volume! This description on converting recipes from volume to weight will help. (What would actually help would be a world wide standard!) I would actually vote for using scales-it is much more precise. Getting a basic “English” cookbook as Jon suggests may be the solution. Someday my site may well have a metric converter but until then, you may want to invest in some “American” measuring utensils! Good Luck Alex! Thanks for all the help, both here and in the comments of other posts on the site! I am looking forward to trying out all the recipes on this site.